[167 Pages Report] The coated steel market is estimated to grow from USD 20.62 Billion in 2015 to USD 26.68 Billion by 2020, at a CAGR of 5.30% between 2015 and 2020. 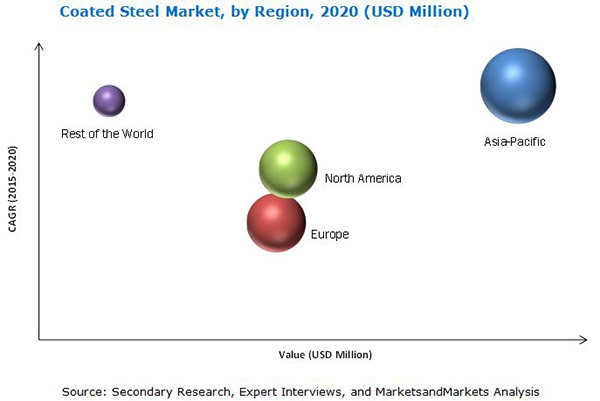 The coated steel industry is witnessing moderate growth because of demand from end-use industries. Coated steel is largely used in building & construction and appliances industries. The coated steel value chain includes coil coatings manufacturers, coated steel manufacturers, and end-use industries. Maximum value addition is done during the manufacturing stage of coated steel. “The study answers several questions for the stakeholders, primarily which market segments to focus in the next two-to-five years for prioritizing efforts and investments and competitive landscape of the market”. The coated steel market size, in terms of value, is estimated to reach USD 26.68 Billion by 2020, signifying a firm CAGR of over 5.30% between 2015 and 2020. The coated steel market registered a moderate growth in the past few years and is likely to continue the same growth in the coming years. This growth is driven by the growing of building & construction and appliances industries. The coated steel industry finds its application majorly in building & construction, appliances, automotive, and other industries, which includes AHU, generator canopy, signage, solar heaters, lighting fixtures, furniture, metal doors & frames, and decking profilers. The growth of building & construction application is driven by increasing urbanization in Asia-Pacific and RoW, which resulted into increased demand for residential, commercial, and industrial infrastructure. Low interest rates on housing loans are also responsible for increase in the demand for new houses, eventually driving the market. Paint is chosen by its resin type, which gives the film its gloss as well as resistance. The polyester coated steel is the major market and is mainly used in the building & construction industry. In siliconized polyester resin, silicone improves the gloss retention and weather resistance of polyester coatings. The other resins used in coated steel are fluoropolymer, plastisol, and others. Transportation, the biggest challenge in the developing countries, demand-supply gap in Europe and the euro crisis are restraining the growth of coated steel market. The coated steel market is highly competitive, with key market players, such as ArcelorMittal S.A. (Luxembourg), SSAB AB (Sweden), Salzgitter AG (Germany), OJSC Novolipetsk Steel (NLMK) (Russia), Voestalpine AG (Austria), OJSC Magnitogorsk Iron & Steel Works (MMK) (Russia), ThyssenKrupp AG (Germany), Nippon Steel & Sumitomo Metal Corporation (Japan), United States Steel (U.S.), Essar Steel Ltd. (India), Tata Steel Ltd. (India), Lysvenskii Metallurgicheskii Zavod Zao (Russia), and Jindal Steel & Power Ltd. (India), accounting for a sizable share in the global market. 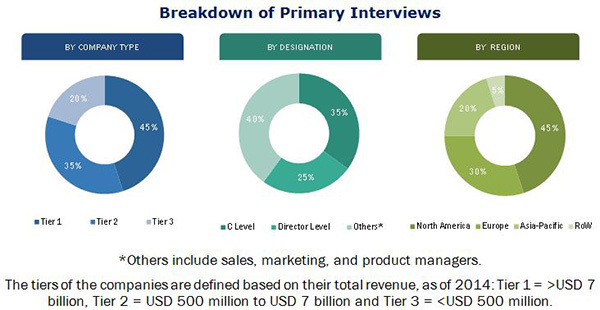 New product development/launches, investments & expansions, acquisitions, and partnerships, contracts & agreements are some of the key strategies adopted by the market players to expand their global presence and product portfolio. Maximum number of market activities took place in 2014. The leading players, such as ArcelorMittal S.A. (Luxembourg), SSAB AB (Sweden), OJSC Novolipetsk Steel (NLMK) (Russia), Voestalpine AG (Austria), OJSC Magnitogorsk Iron & Steel Works (MMK) (Russia), ThyssenKrupp AG (Germany), Essar Steel Ltd. (India), and Lysvenskii Metallurgicheskii Zavod Zao (Russia) contributed mainly in terms of number of developments. 11.14 Jindal Steel & Power Ltd.